What a lovely brunch menu, K! I have to say the Smoked Salmon, Goat Cheese, Dill medley was my favorite although visually, I loved the cute cherry tomato halves bopping up in the Tomato and Manchego Quiche. All of these eggy custard delights brings me back to a time where I despised eggs (hard to believe, I know). It was in college where I first pushed myself to sample the dining hall’s made-to-order omelettes and was slowly converted. I now will even go to extremes and indulge in the Egg in a Jar at West Bridge in Cambridge which is basically a cute mason jar filled with a soft poached duck egg, pomme purée, hen-of-the-woods mushrooms, and fried chicken skin, all stirred together. Oozy and delicious. To complement the savory and to keep in mind non-quiche fans (gasp!) 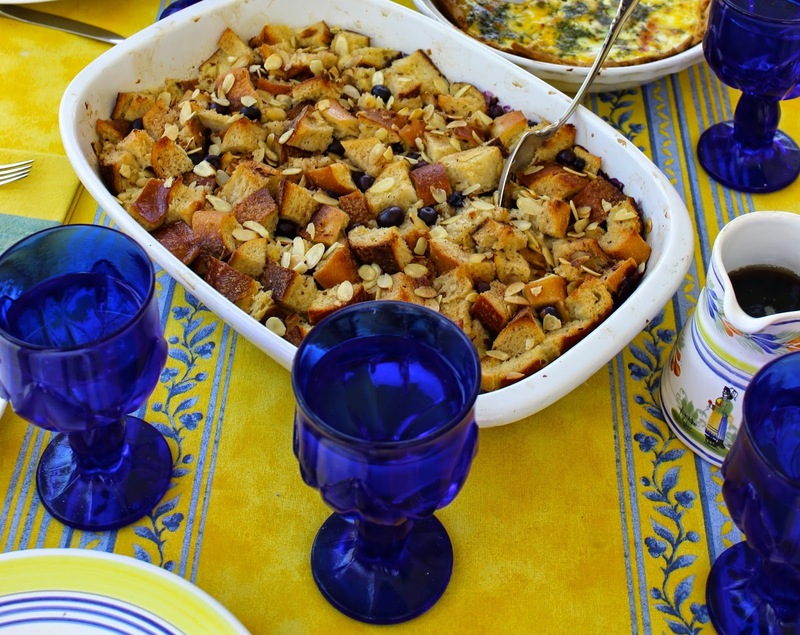 at a recent brunch, I assembled a Lemon, Blueberry and Almond Baked French. The bursting candy-like blueberries, citrus soaked French baguette and crunchy almonds add the needed sweet-note to the table. With warm maple syrup on top, the custard-like bake is good to go! Grease a 9 x 13-inch baking dish with softened butter or cooking spray. Add the cubed bread, almonds and blueberries and toss until all ingredients are evenly distributed. In a large bowl, whisk the eggs vigorously for 1 minute. Add the milk, maple syrup, vanilla extract, ground cinnamon, nutmeg, salt and lemon zest. Whisk until all ingredients are combined. Pour the mixture evenly atop the ingredients in the baking dish, making sure all pieces of bread or submerged. Let sit for 20 minutes to allow the liquid to absorb. Sprinkle the top evenly with brown sugar. Bake for 40 to 45 minutes until the top is slightly crusty and golden. Spoon the casserole into dishes with warm maple syrup drizzled on top. Serves 10-12.